Tracing developments in sacramental theology over the past twenty-five years, this study explores a growing ecumenical dynamism in both the academic study of sacramentality and its centrality in pastoral applications. But how does ecumenical excitement in a renewed discovery of sacramental theology fit with different theologies of church and different pastoral beliefs and practices? How does the universality of academic accessibility in the form of an expansive ecumenical sharing of perspectives meet the particularities of pastoral reality and ecclesial polity? Arguing in favor of fruitful ecumenical conversation, this book also focuses on the crucial interaction of ecclesiology, liturgical practice, and sacramentality, which raises the need for a creative tension between the particularities of a given ecclesial system and the catholicity of Christian sacramentality. Using Anglican sacramental theologies and Anglicanism as vehicles of exploration, this study contributes to an overview of the state of the field of sacramental theology in the twenty-first century while challenging the assumption that one size fits all. In sacramental theology, as in other important areas of Christian life, unity in diversity may be the basis for authentic lived sacramentality. Lizette Larson-Miller holds the Huron-Lawson Chair in Theology at Huron University College, University of Western Ontario in London, Ontario, Canada. She has also taught sacramental theology and liturgical studies at Loyola Marymount University, the University of Notre Dame, Church Divinity School of the Pacific, and the Graduate Theological Union. Her educational background includes an undergraduate music degree in conducting, an MA in liturgical studies from Saint John's University, Collegeville, and a PhD in history and liturgical studies from the GTU. She has written extensively on rites with the sick, dying, and dead, as well as on sacred space, popular religiosity, and contemporary ritual issues. Ordained priest in the Episcopal Church in 2002, she has continued working in various parishes while teaching and is very interested in maintaining the connection between dedicated academic work and its contribution to pastoral ministry. "With an impressive command of recent literature across the ecumenical field, Lizette Larson-Miller has provided a timely and useful survey of the status quaestionis for sacramental theology today. While attentive to sources and questions in the Anglican community, the author's astute identification of the key themes driving current theological inquiry into sacraments and sacramentality ensures informative and stimulating reading for a wide audience." "Larson-Miller has produced a superbly useful book." "Sacramentality Renewed is an important contribution to the ecumenical body of writings on the renewal of sacramental faith and practice that have been published in recent years. It fulfills the promise offered in Lizette Larson-Miller's subtitle in drawing together diverse perspectives regarding the meaning of the sacraments emerging from `contemporary conversations.' The variety of voices which we hear as we read this book reflects its strongly ecumenical character, to which Larson-Miller brings her own theological and pastoral insight. "The author begins with an exploration of the vocabulary of sacramentality, thus enabling readers to engage a subject for which, in the past, the words themselves have often been a source of confusion and conflict among the churches. Succeeding chapters build on that common ground as they explore fundamentals of Christian faith in their relation to a sacramental understanding of the Church itself. "These diverse lines come together in the final two chapters of the book: `Sacramental Ecclesiology' (chap. 6) and `With What Words?' (chap. 7). In the first paragraph of chapter 6, the author asks the question on which all aspects of sacramental meaning depend: What is church? The chapter then explores with enormous insight a variety of ecclesiologies-that is, what is understood to be the nature of the Church. These have been the focus of extensive debate in recent years. "Finally, in the concluding chapter, Larson-Miller points to what may be called the `meta-textual'-the ways in which space and time affect our sense of the sacramental actions in which we participate. Professor Larson-Miller's book offers valuable insight not only into the fundamental role of the sacraments in the living of Christian faith but also into how the sacraments both signify and nourish the corporate nature of that life." "Crucially important to anyone who wishes to do responsible theological work in the Anglican tradition." "Larson-Miller's work explores the complex issue of sacramentality in a thorough, well-organized manner. Her ecumenical approach is well-researched—the breadth of references and her understanding of sacramental theology in the Christian tradition make this text a significant contribution to contemporary conversations for those who are serious about the importance of this topic." "The author impressively crosses the boundaries of different theological traditions. She offers some challenging connections that point the reader to a broad common ground, rooted in creation, and at the same time the specific demands of different ecclesial practices." 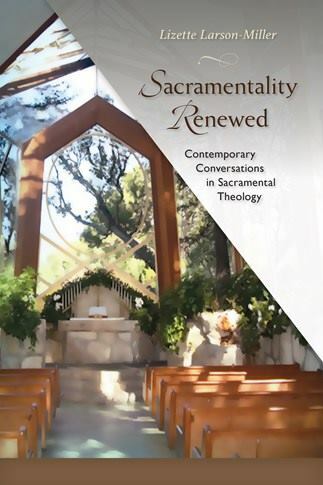 "Lizette Larson-Miller's insightful study of the renewal of sacramentality in the contemporary church is as wide-ranging in its thematic scope as it is in its engagement of contemporary conversation partners. From her liturgical perspective, Larson-Miller invites us to think anew about central theological doctrines, be it soteriology, the paschal mystery, real presence, or ecclesiology. Squarely rooted in her own Anglican tradition, she draws on scholarship from all strands of Christianity and so offers a truly ecumenical plea for the rediscovery of sacramentality. This is a much-needed study, which not only sums up the current state of the field but also offers a strong constructive proposal." "Larson-Miller encourages all to work together to shape a new sacramental way of being that strongly influences sacraments and sacramental practices that are the means of participation in the living God. By doing so she has given us an important and timely resource for study, reflection, instruction, and practice."